There will be no planes flying into Bali today. There are no stores open, no restaurants, no gas stations. There are no people walking in the streets, no motorbikes, no cars. 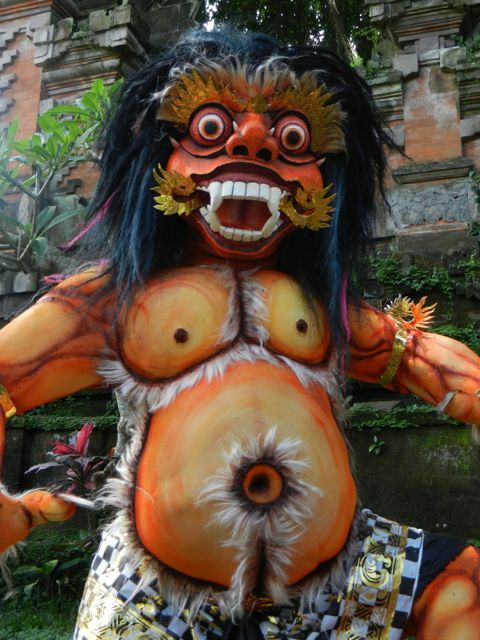 Today is Nyepi, the Balinese New Year, a day of silence. All of Bali stops for this day of meditation and introspection. The most devout Balinese Hindus will not speak, eat, or use electricity today. If anyone ventures out into the streets, volunteer security guards will send them home. I’m sitting in our outdoor living room while I write this. The sound of human life is absent except for my children playing in the bedroom. The wind rustles the trees, the roosters crow, the dogs bark, the cicadas chirp. 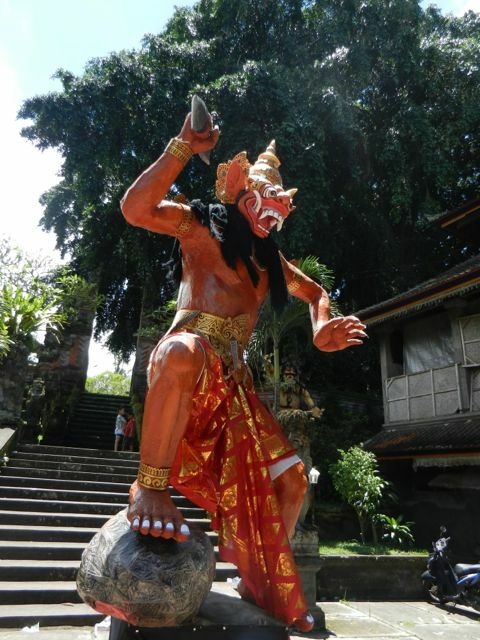 On the night we arrived on Bali we started to notice large statues being constructed in the village temples. 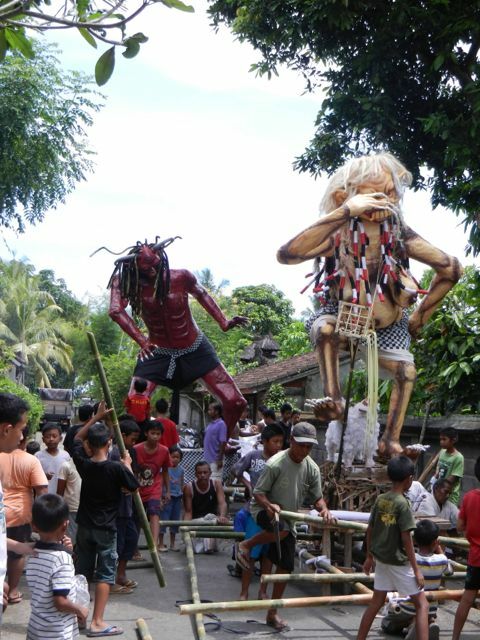 We soon learned that these statues, called Ogoh Ogoh, were being constructed for Nyepi. 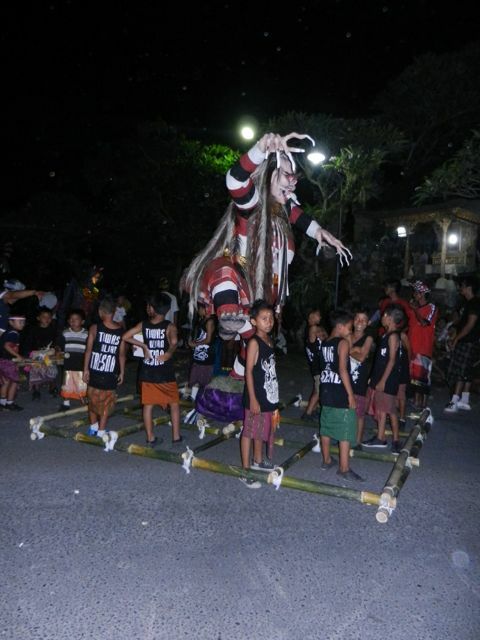 On the eve of the Balinese New Year holy men imbue the statues with evil spirits. When night falls the statues are carried through the streets, they are shaken up and down, turned round and round, and side to side. All the while an army of men bang on drums, gongs, and cymbals in an effort to scare the evil spirits. 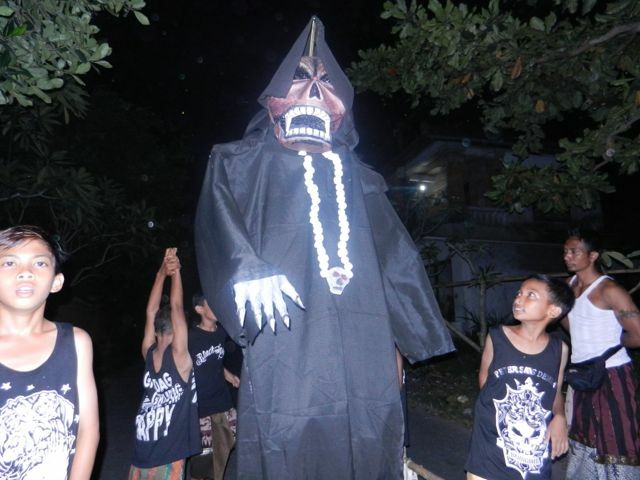 At the end of the night, what is left of the statues (they are made of styrofoam and fall apart in the jostling) is cremated and it is believed that the evil spirits are then released and have been so scared they will leave the island of Bali. Just in case that didn’t work and the evil spirits decide to hang around, the next day is The Day of Silence where the Balinese stay home and make no noise. 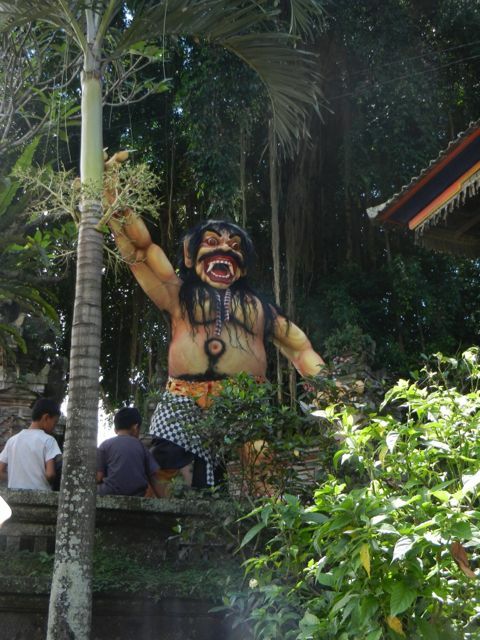 It is believed that the evil spirits will think Bali has been abandoned and will be so bored they will leave the island. 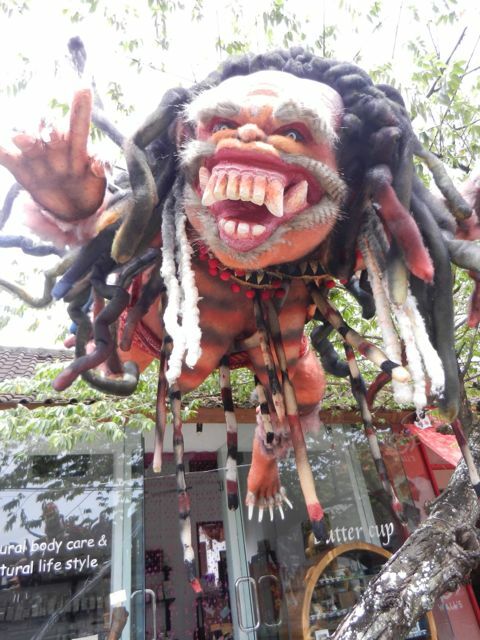 Yesterday we drove around to the different villages to see all of the different Ogoh Ogoh. We were amazed at what artists could create out of styrofoam! 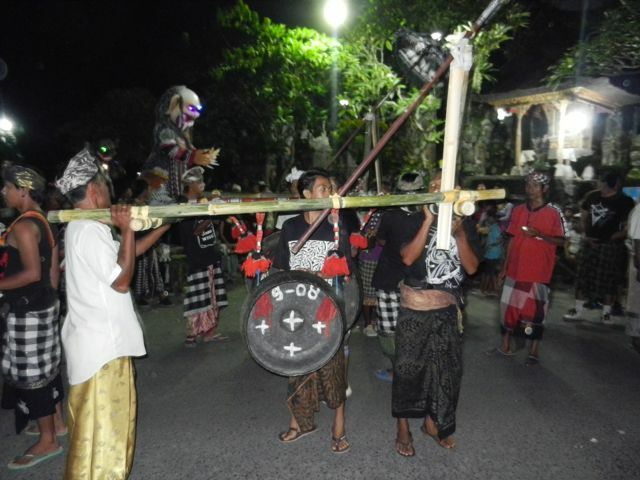 We were faced with the choice of heading into Ubud where the celebration would be much bigger but we would be with many other tourists or to stay for the local celebration in the village in which we are staying. After much back and forth we opted for the village celebration. Just before sundown our host family began walking around their house compound beating the ground with sticks. We were then told it was time to go to the temple. The “parade” of Ogoh Ogoh soon was underway, the statues were carried by young men and boys through the streets while families followed to watch. We joined in the procession and our family, along with our Australian friends who live down the road, were the only foreigners in attendance. 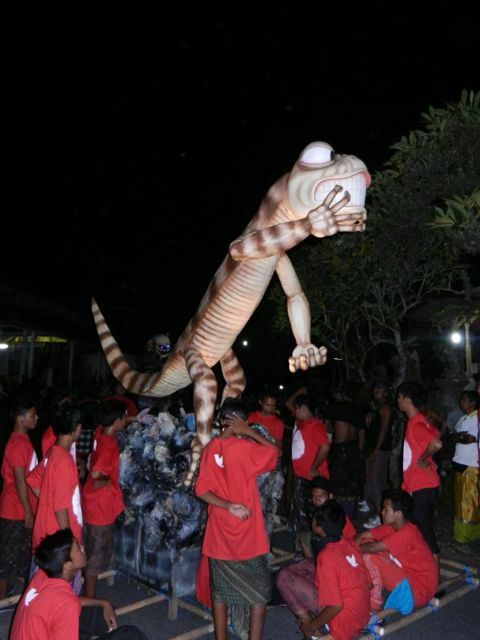 As the parade went on the frenzy intensified, sometimes we had to jump out of the way to avoid getting hit by the bamboo platforms as the sway and turns of the statues became more and more out of control. Young men put alcohol in their mouths and blew fire towards the statues and the music became louder and louder as the evening wore on. The statues began to fall apart from the violent shaking, a hand here, a head there, and every time something fell the crowd would erupt in cheers! We were told by our hosts that there are usually firecrackers and homemade bamboo rockets that add to the noise but there have been too many injuries so this year they have been banned. Thank goodness! We continued on with the crowd for the whole precession which lasted about an hour and a half. Once we returned back to the temple the crowd began to disperse and we took our cue to go home. By then the children were exhausted from the excitement of the evening. 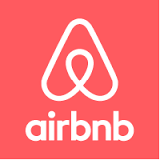 It was one of the most amazing, interesting, and culturally broadening experiences we have had on our trip. Now “Ogoh Ogoh” will be a household name in our family! Those ogoh ogohs are amazingly intricate! I’m so glad you were able to experience a bunch of them in your neighborhood. I love how exaggerated they look, the fangs, the nails and the big bellies. 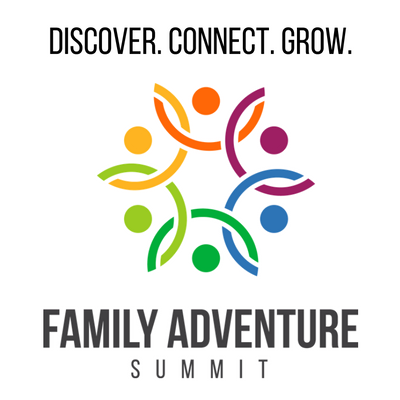 Wow–what an experience! How luck you were to be there for it!